North Carolina test results and school grades have shown that Charter schools outperformed public schools with the percentage of Charters earning better ratings across the board than Public schools. Public schools largest grade score percentage (43%) earned a “C”. Charter schools also outperformed public schools in both reading and math. Last week the Department of Public Instruction (DPI) released End of Grade test results for the just completed 2014-2015 school year. EOG’s are standardized tests administered to all students in grades 3-8 in the state. This allows for a uniform way to measure student achievement and to make comparisons from school to school and system to system. This also allows for comparison of charter public schools to traditional public schools. In Southeast NC public charter schools are producing the highest student results on EOG tests. The comparative chart I have in my possession clearly shows significantly higher achievement in all subjects (Math, Language Arts, Reading, and Science). These schools do not follow the Common Core curriculum. Thankfully the Common Core curriculum will soon be eliminated form North Carolina. I’m the proud sponsor of that legislation… Charter Day School in Brunswick County has virtually the same demographics as its neighbors in the traditional public schools in Brunswick and New Hanover counties. Note: These charter public schools do not use the state-mandated Common Core curriculum which EOG tests are designed to test. 1. In the Southeast charter public schools are doing much better than their traditional public school counterparts. 2. 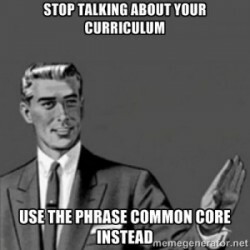 The Common Core curriculum is not the panacea it’s proclaimed to be by some. First, it is important to note that both the scoring system for schools and for North Carolina exams were altered in the last year. This makes comparisons with prior years very difficult. There are a lot of reasons why Charters outperformed Public schools and some claims about the results are muddying the waters. Well, that part is definitely true – just look at other states ‘stagnant’ and declining results and it’s clear as day. Other parts of the letter are a little misleading, so let’s clarify. I can only assume, by mention of Brunswick county, that Sen. Tillman means Charter School Region 2 in his newsletter. The claim that charters aren’t using the common core curriculum might be true, however there is an important distinction to be made between curriculum and standards. Charter Day School, as mentioned by Tillman, might not be using the Common Core curriculum, but as a public charter they are required to follow the state’s Standard Course of Study. That Standard Course of Study right now in North Carolina for Math and English language arts is Common Core. Yes, Sen. Tillman was the author of SB 812 which generated the Academic Standards Review Commission (ASRC) which is now reviewing the standards in North Carolina. Those who have been engaged in the NC Common Core fight know SB 812 as the ‘Chamber of Commerce’ version; it was a much weaker bill than HB 1061. Sen. Tillman, to his credit, showed up to the first meeting and said that the legislature would not accept a ‘rehash‘ of Common Core. To his detriment, I don’t believe Sen. Tillman has shown up to an ASRC meeting since that first one and has made no statements about what will happen when/if the State Board of Education decides to ‘blow off’ the commission’s findings. Rep. Larry Pittman, who helped author HB 1061, has been at nearly every meeting. Also, Rep. Michael Speciale has attended at least half of them. No other legislators have bothered to show up. If that ‘blow off’ scenario plays out, I would recommend to North Carolina Legislators to look at Ohio’s HB 212 or Local Authority Restoration Act (LARA), which was authored by Rep. Andy Thompson. The bill is long, but does a lot of things, one of which is to make Common Core and it’s tests optional for the school districts in his state. I had a chance to interview Rep. Thompson about this bill. Read the whole thing at Heartland Institute. This entry was posted in Charter Schools, EDUCATION, NC DPI, Testing and tagged Charter Schools, Common Core, Jerry Tillman, Public Schools, Test Scores. Bookmark the permalink.